This multi-mountain trek inspires hikers to look beyond Phoenix’s iconic peaks. One fine fall morning last year, I found myself atop a ridge at South Mountain Park’s Alta Trail after a steep uphill trek that tested both my legs and lung power. The view from the top? Fantastic: desert below, city nearby and the Estrella Mountains in the distance. Fueled by trail mix and Gatorade, I hiked up several more summit trails that day, including the Phoenix Mountains Preserve’s Lookout Mountain and Shaw Butte and, back at South Mountain, the Holbert Trail. All of this mountain-scaling was part of the annual Phoenix Summit Challenge (more on that later), and, later that evening, as I pried my feet out of my hiking boots, it dawned on me: When it comes to urban peak-bagging, the iconic pinnacles of Camelback Mountain and Piestewa Peak are just the start. 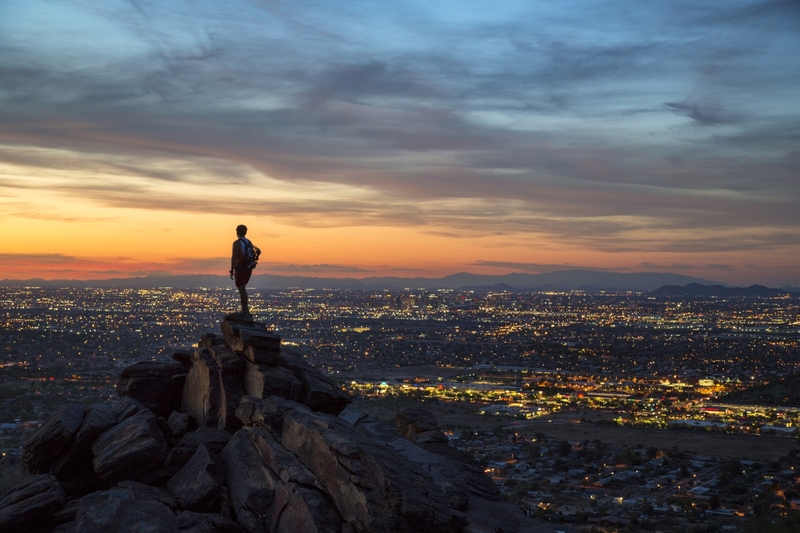 For years, I joined the masses who meander, march and run up the summit trails at Piestewa Peak and Camelback Mountain, two of the most popular hiking destinations in metro Phoenix. Circling their trailhead parking lots on busy weekends, I waited patiently for someone to pull out so I could park, then commenced hiking uphill in a nose-to-tail fashion. Why? For one thing, I think a hike is not a “real hike” unless it involves a lung-busting, endorphin-producing climb with a rewarding view at the top. Plus, I had only a fuzzy knowledge of other summit trail options. Apparently, I am not alone in this thinking, especially when it comes to Piestewa and Camelback. 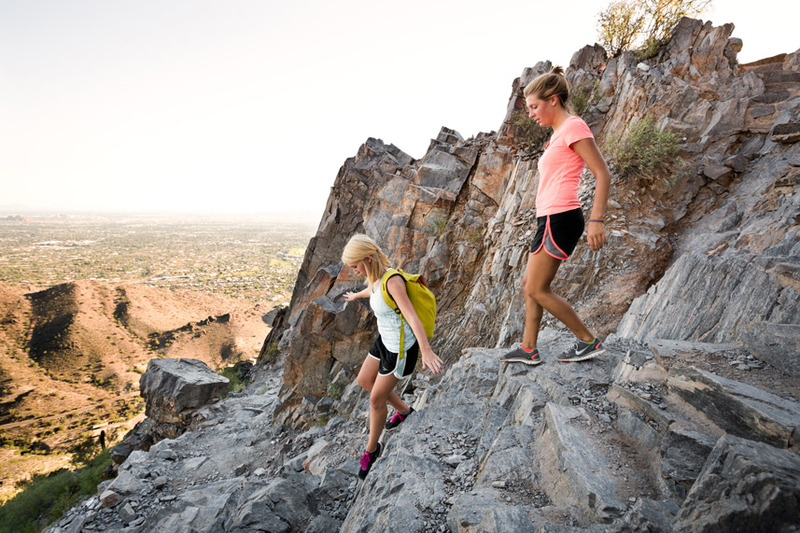 Every year about 750,000 people make their way up Camelback Mountain’s two summit trails, while Piestewa’s beloved summit trail sees some 350,000 pairs of hiking boots annually. But, says Miller, those two summits and their trails attract legions of hikers, and the parks and recreation department is trying to fan out folks like me to other trails, other summits. 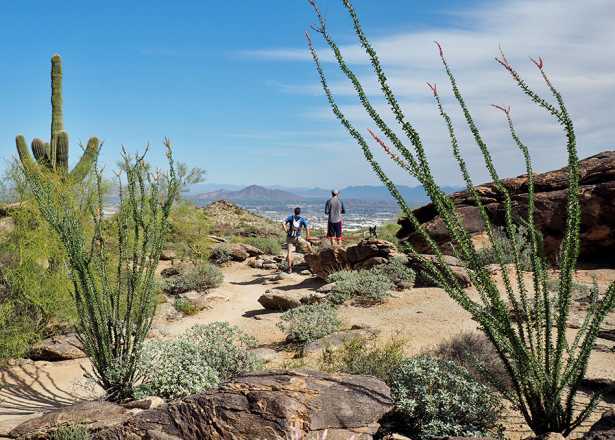 Indeed, with more than 40,000 acres of parks and desert mountain preserves in the City of Phoenix, along with some 200 miles of designated trails, there was no need for me to keep marching, lemming like, up those two popular peaks. To learn about some of my other options for “real hikes”—in a baptism-by-fire sort of way—I signed up for last year’s Phoenix Summit Challenge. It’s a one-day, November fundraiser for trail maintenance and building that puts you out on four, five or seven summit trails. You choose how many summits you want to attempt based on your fitness level. 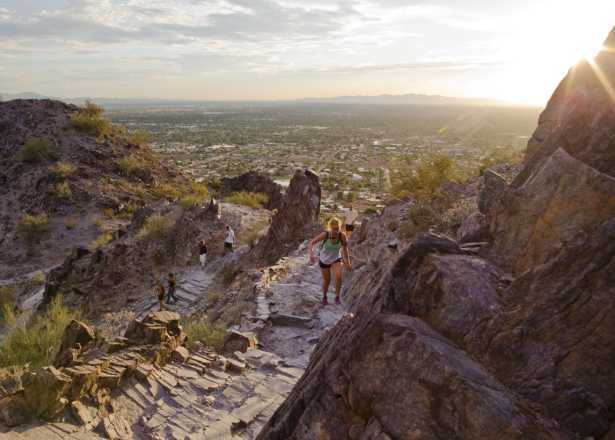 With an early-morning start and maps in hand, your goal is to march up each mountain, get your “passport” stamped and a photo taken at the top to prove you made it, then end up at South Mountain Park for much-deserved beer and dinner. There’s a similar event in January, the National Trail Trek, a 15-mile hike along the ridge at South Mountain Park. 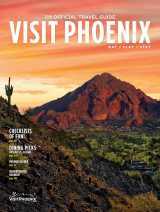 Both events sell out in a nanosecond, but the intention, says Miller, is to acquaint hikers with the city’s other summit trails and preserves, stretching from the venerable South Mountain Park/Preserve, founded in the 1920s, north to the Sonoran Preserve, the city’s newest, with 36 miles of trails. It’s working. I’ve expanded my repertoire of summit trails. I like Shaw Butte Trail because part of it is a paved road that winds past the ruins of what was once a swanky hillside restaurant. And, at South Mountain, I like the Holbert Trail, because it rises steeply to Dobbins Lookout, which offers clear views of downtown Phoenix. I’m one of those people. I like that peak experience. But my knowledge of “real hikes” beyond Camelback and Piestewa is no longer fuzzy. Many other Phoenix summits now stand out, in crisp relief, in my hiking memory bank, and I have the Phoenix Summit Challenge to thank for that. I can’t wait to do it again this year. Learn more about the Phoenix Summit Challenge. 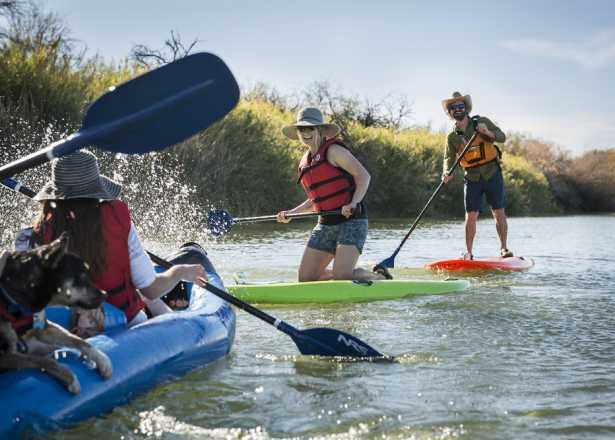 For hiking recommendations from local guides and information about more than 140 trails in the Phoenix area, download our Phoenix Trail Guide. Order a free official trail guide or view the online version for tips, expert picks, maps and more.